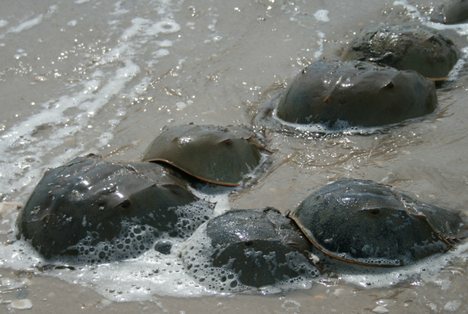 Around the full and new moons in May and June, a strange phenomenon occurs all up and down the Atlantic Shores of the US: the spawning of the horseshoe crabs. Sean and I first discovered this event about 8 years ago when we set off on an evening paddle to watch the full moon rise over a nearby bay. As we paddled close to shore, we noticed piles of horseshoe crabs in the shallows and along the beach. On closer inspection, we realized they were mating, and thus began our fascination with these strange prehistoric animals. Where we go we’ll often see a dozen or two mating pairs in a single trip, but there are places where the crabs are more abundant, and hundreds of pairs pile up on the beach. Horseshoe crabs look ancient, and in fact their origins predate most species on the planet. These living fossils are covered in spiny body armor and have a long, spike-like tail that they use for righting themselves if they become flipped upside-down. During Mating, the male clings to the females back, and they stay linked for hours. The female will then dig a hole in sand or mud, and the male will fertilize the 60-120,000 eggs as she lays them. These eggs are an important food for at least 11 species of migratory shorebirds, as well as many other small shore animals. After mating, the male and female separate, and head off into deeper waters. The mating of the horseshoe crabs is a great natural event to look for with kids. The crabs themselves are fascinating with their spiny armour and long spiked tail, and the presence of so many in one place can be awe-inspiring. Add in some moonlight and an expedition that involves flashlights, and the event becomes even more fun. It’s also a great chance to show kids how to observe nature without touching (and potentially disturbing a special moment for the crabs). If you are doing nature journaling with your kids, this is an exciting observation to write about. 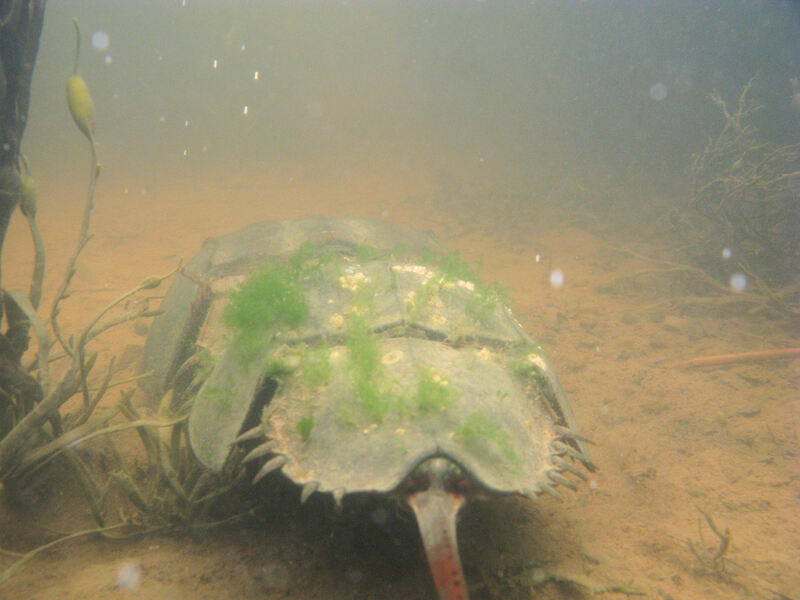 If you want to find popular spawning locations near you, the University of Delaware’s Horseshoe Crab Spawning Website has a great page with an interactive map that will help you plan your trip. I particularly like their tip about using a red filter on flashlights and camera flashes when doing night observations to avoid blinding the animals for an entire tidal cycle.